The ability to remain relaxed in adverse situations is an important media training skill and one John Key used well at Waitangi yesterday in the face of heavy protest. 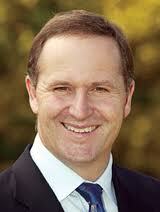 His ability to smile in almost any situation is one reason Key is so popular with voters. From a media training standpoint, this makes his look confident, warm and in control. This is what he did yesterday, even though his speech was drowned out by protesters and he had to leave early. Throughout his visit he smiled, joked with people and appeared well in control of the situation. His ability to smile, even in tough situations, is a unique skill and one Key uses well. This is important from a media training perspective because a person's natural look often appears like a frown on TV. This was an issue for Phil Goff because of his more serious media persona. Next time you see Key in a TV interview, become a media training critic and watch his demeanor.